The Fermtech ProFiller is a relatively new product on the market with a few improvements that make it superior to traditional bottle fillers. Its design allows faster filling of bottles over traditional bottle fillers, filling around 20% faster. 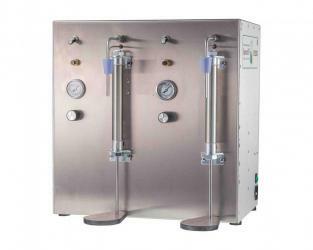 It is designed to adjust to any size bottle with any sized punt without reducing flow. The ProFiller has a flow control clip as well, and the barbed fitting makes connection to tubing a breeze. We recommend either 3/8" ID tubing, but 5/16" will work as well. Blichmann has a unique way of developing new products. They first look at existing home brewing technologies, finds what is wrong with them, and aims to solve these problems. There is no better example of this than the Blichmann BeerGun. Kegging is easy and wonderful, but provides a host of problems when brewers go to bottle from the keg. Whether it is for competition or just to give friends a bottle or two, brewers have had to deal with imperfect counter-pressure fillers that are overly complicated, or homemade bottlers that lead to oxidation and foaming issues. 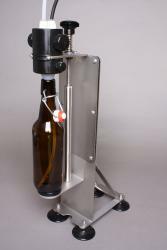 The BeerGun solves these issues, creating the ideal system for bottling from a keg! 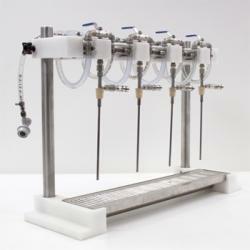 The BeerGun can be used to purge bottles of oxygen with pure CO2, fill without foaming or carbonation loss, and provides a consistent fill by placing the valve at the end of the gun. This means oxygen-free beer with carbonation intact and no messy foam spills to clean up! Quiescent Flow technology, a patented technology employed by Blichmann, minimizes the amount of agitation the beer undergoes when dispensed from keg to bottle or growler. This leads to the perfect fill with little to no carbonation loss, every time! Stainless steel design ensures ease of cleaning with minimized chance of bacterial activity.It only takes literally seconds to take apart! The beer gun is simple, intuitive, practical, and gives a great fill every time. It just makes sense! 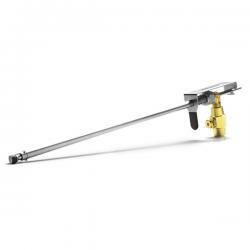 The Blichmann BeerGun comes with the BeerGun, a double ended brush for cleaning, and 10 feet of 3/16" ID liquid line. 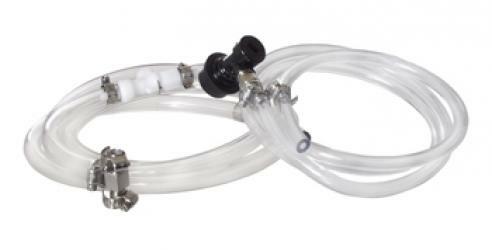 However, in addition to this, a liquid disconnect with a 3/16" swivel nut or barb is required to hook the BeerGun up to the liquid side of your keg. 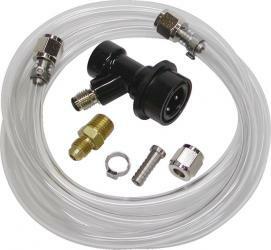 In addition, a brass 1/4" NPT x 1/4" flare adapter and a swivel nut set (preferably 5/16", as is standard for gas side barbs) is required to hook the BeerGun up to CO2 line. On the CO2 side, you will need a way to split your CO2 so that one line goes to the keg through a gas disconnect, and the second goes to the BeerGun. This can be accomplished by using a two way manifold, or a wye splitter with two shutoff valves. 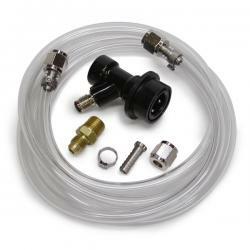 Except for your chosen method of splitting CO2, the Blichmann BeerGun Accessory Kit comes with everything you need to connect your BeerGun to a keg. 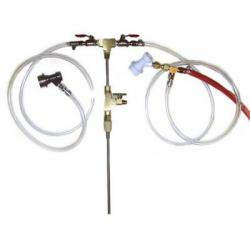 Note that if your way of splitting CO2 includes barbed fittings, you may need to remove the 1/4" flare attachment from one end of the CO2 line included in the BeerGun Accessory Kit and connect to the barb with a clamp. This bottle filler features a spring loaded tip that pushes the tip into place when not in use, stopping the flow of liquid. Flow is easily restored by pressing the tip against the bottom of the bottle. 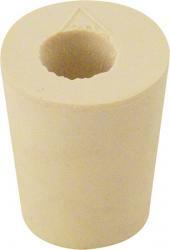 It is a 5/16" filler that works with both 5/16" and 3/8" ID tubing. 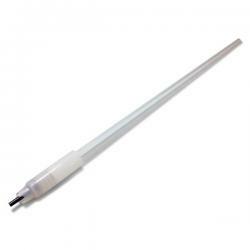 It can be used with a standard bottling bucket or a regular sized Auto Siphon. It makes filling bottles a snap! A larger bottle filler that will fit on larger 1/2" ID tubing. 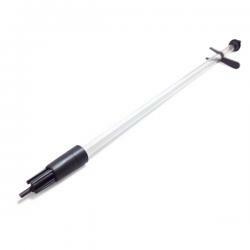 If you have a large Auto Siphon and wish to use it to bottle, this is the bottling wand for you. It does not have a spring in the tip; instead, it has a check valve that drops into place when it is not pressed against the inside of the bottle. Once pressed, liquid will flow, filling your bottles. 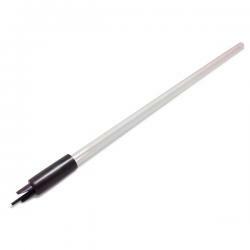 For a large Auto Siphon, this is the bottling tool you need. 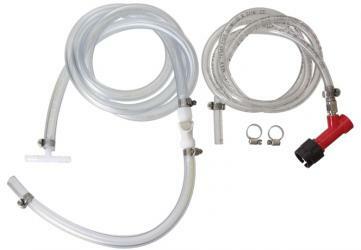 The Blichmann BeerGun accessory kit includes everything you need to get your BeerGun filler connected to a standard ball lock keg. 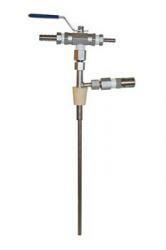 It comes with a ball lock liquid disconnect, a liquid swivel nut set, a 5' length of CO2 tubing with 1/4" stainless flare connectors on each end, a stainless clamp, and a brass 1/4" NPT x 1/4" flare adaptor for connecting to the CO2 valve on the BeerGun. 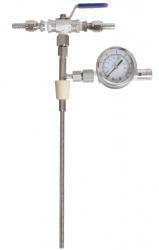 All that is needed in addition are a spare CO2 port and shutoff valve on your regulator. We recommend either a Wye fitting and two shutoff valves with checks, or a 2-way manifold hooked up to your regulator. With these, you will be filling from the keg in no time, with no worries or hassles!